Have you ever had those moments when you just hate on your dominant hand nails? For the most part I love the nails on my left hand. I don’t have to do a lot to them to keep them neat and in shape…but today they just look horrid with nail polish on. I am so tempted to take EVERYTHING off because I can’t even handle it right now. This art did take me a boatload of time; specifically, the entire Bachelor finale and after the final rose episode, so maybe I’ll keep it on. I love how the final result came out, though, but it looks hideous against gross nails. Know what I mean? 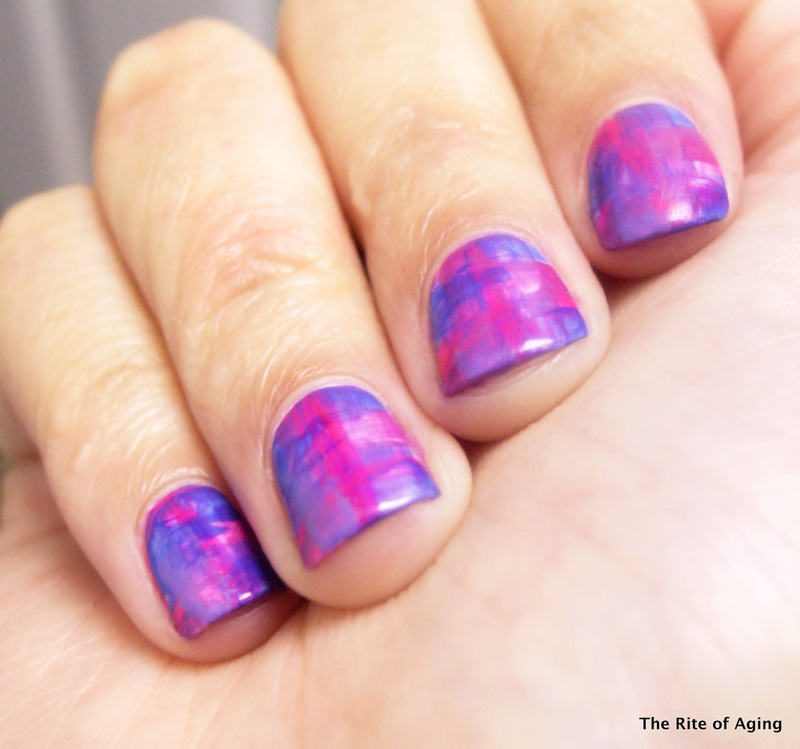 I wanted to try this watercolor nail art again with pinks, purples and blues. I really like messing with a look until I have it “just right” without it looking bulky or manipulated. Thinning the polish with acetone ensures neither of those happen! I think the watercolor distressed look is really RA-friendly but I would necessarily classify this look as such. The polishes I used definitely worked differently than the ones I used in the green plaid (linked here) because I think they were a lot thicker. This didn’t make them harder to work with but definitely created a different effect. I sealed everything with Seche Vite but everything still finished sort of matte! I hope you like it! For this look I started with Formula X for Sephora Thrilling as my base. I did…and totally shook my head. Chris is clearly not a man who understands nail polish…Heh! Oh! I probably misheard I thought he was making fun of her manicure and was looking forward to getting it dirty! Hah…though, I did really the color she was wearing! …I waited to look at Becca’s nails in the limo and she didn’t put her hands to her face!! Ugh! Yeah, he was making fun of her cute pink nails. But I bet it’s cuz he liked them!